The High Tech Center, a standard and assistive computer technology lab where students with disabilities can work independently or with trained consultants. The lab also features individual and accessible computer workstations in a work-friendly environment. TRiO services for students with disabilities serves more than 200 students each year with intensive, individualized academic advising, writing assistance, and more. Workability IV, helping SDSU students and alumni with disabilities achieve their career goals. In 2006, Student Disability Services opened a new Test Accommodation Center for students needing special services. Group and individualized facilities are now available, and each test station can be individually monitored via closed-circuit video cameras. 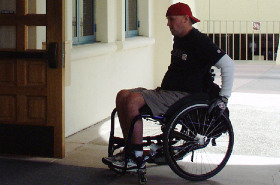 Getting Around SDSU: View the campus map for disabled info and access routes (PDF). Contact SDS to report any problems or concerns related to architectural barriers, transportation or construction. In 2007, Student Affairs took a lead role in implementing CSU Executive Order 926 on Disability Support and Accommodations, to make all websites accessible per Federal Section 508 guidelines. This ensures that our students with various disabilities have access to SDSU information on the web. 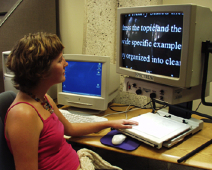 In 2010, Student Disability Services continued to provide alternative format materials for students with visual impairments or reading disorders. New software helped manage and track alternative media and utilize existing CSU-housed materials. In 2010, Student Disability Services and Career Services continued their partnersip with the Workability IV Program, an ongoing interagency collaboration with the California State Department of Rehabilitation that matches SDSU students with disabilities to career positions in their majors. 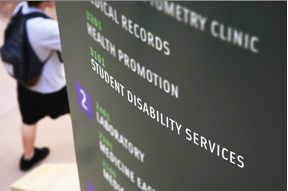 In the 2010/2011 academic year, Student Disability Services served about 1,000 students with certified disabilities and monitored more than 4,100 accommodated tests. SDSU Career Services and Student Disability Services co-administer the on-campus Workability IV Program, serving about 300 students annually. The program has won awards from California's Department of Rehabilitation, and it ranked first in the state in the 2010/2011 academic year for successful client placements.